The results of the presidential and pundit panderer polls are in. Neither poll was close. 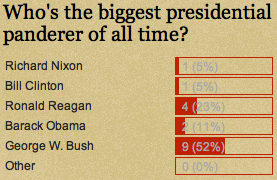 Among the presidential contenders George W. Bush easily bested the rest of the field for biggest panderer of all time. Panderbear's personal favorite was Ronald Reagan, because his introduction of supply-side, trickle-down economics served as historical antecedent to many economic ills including massive deficits, exploding income divergence, and the growing wealth gap. Nevertheless, Panderbear has to admit that Bush II is an excellent choice. After all, he took Reaganomics to new heights of fiscal insanity. Likewise, the pundit panderer poll was quite lopsided. Rush Limbaugh, not surprisingly, was a runaway favorite. 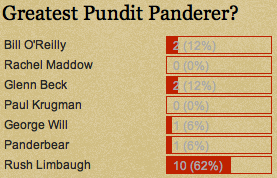 Panderbear was absolutely thrilled to receive a single vote as greatest pundit panderer. (Yes!) Being included in the ranks of such luminaries as Rush, Glenn Beck, and Bill O'Reilly is quite an honor. To whomever voted for Panderbear, thanks a bunch.